Tropical Storm Noel began lashing Haiti with heavy rains late Sunday as it slowly neared the impoverished Caribbean nation, generating fears of flash flooding on deforested hills often blanketed by rows of flimsy shacks. Noel, the 14th named storm of the Atlantic season, was projected to reach Haiti and the Dominican Republic - which share the island of Hispaniola - early Monday, before heading on toward Cuba. The strengthening Caribbean storm, which formed into a tropical storm earlier Sunday, poses a serious threat to Haiti, where floods killed at least 37 earlier this month. Noel had sustained winds of about 60 mph and its outer bands were dumping rain over Hispaniola late Sunday, according to the U.S. National Hurricane Center in Miami. 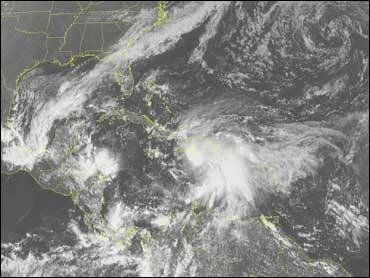 At 11 p.m. EDT, Noel's center was roughly 105 miles south of the Haitian capital of Port-au-Prince, forecasters said. The meandering storm was spinning north-northwest at roughly 5 mph, which would bring its center near the southeastern peninsula of Haiti early Monday. A tropical storm warning was issued for the entire Haitian coastline and parts of neighboring Dominican Republic's southern coast. Flood concerns on Saturday forced three U.S. senators to cut short a trip to Haiti, where they'd planned to survey damage caused by earlier storms. "It was just raining like mad," Sen. Tom Harkin of Iowa told The Associated Press before flying out of Port-au-Prince Saturday evening. Senators Jeff Bingaman of New Mexico and Tennessee's Bob Corker were also visiting. Forecasters said Noel, with tropical storm force winds fanning 115 miles from its center, could drop 12 inches of water on Hispaniola, southeastern Cuba and Jamaica. Dominican authorities said at least 600 people had been evacuated as the storm touched off landslide, flooded rivers and pushed storm surges onto Santo Domingo's seaside boulevard. Swollen rivers also forced evacuations in Cabaret, a town north of Port-au-Prince where floods killed at least 23 people earlier this month, said Marie Alta Jean-Baptiste, director of Haiti's civil protection agency. "We are working hard to make sure everything goes well and that every citizen knows a cyclone is coming," Jean-Baptiste said. It could take days for Haitian authorities to learn of flooding in some parts of the country, where communications are limited. "I don't envision the storm will have any tangible impacts on detention operations as the modern facilities have been constructed to withstand high winds and significant rainfall," said Navy Cmdr. Jeffrey Gordon, a Pentagon spokesman.